Prompt, by Tara Laskowski: Killer Santa on a moving train. Go. Emberhearth was right twice. The hot chocolate at the Metropolitan was better than the slop we dished out at the office, and there was no way I'd be able to sleep tonight after seeing what happened to the 9:40 Express. I trotted Peppermint past the police cordon, stalling because I wasn’t ready to see what I was looking at. Neither was Peppermint. He snuffed and snorted as we passed, inspecting the frost-tinged air’s cheer – the factory floor tang of red hot metal, the acrid char of burning fabrics and plastic, the fireside warmth of smoldering wood. I’m not sure if the coppery taint of blood was in the air or in my imagination, but I knew it was there. The wreckage of the Polar Express was on our left, the train cars more or less intact. That soon changed, progressing from off-the-rails but upright to tipped over on their sides, then to folded and flipped, and finally to shredded and accordioned. As we neared the front end, it was impossible to tell where one train car ended and the next began, and I simply tried to identify recognizable shapes. A hill of broken metal that used to be the front of the train rose before Peppermint and I as we neared Gingerbread Crossing. It was still burning in places, and weaving black cords of smoke where it was not. Peppermint tried to pick up speed, stomping his hooves to pull us past the ugly scene, but I reigned him in. I wanted to take my time, get my bearings so I could walk the scene free of emotion. I was trying to get my mind right. But that would be difficult. Whatever was going on, it was enough to spook my reindeer, and when a bold young buck like Peppermint gets spooked, a broken down old elf like me takes note. Noticing. I guess that’s most of what I do. The rest of my job is less predictable. I’ve been chasing shadows through an endless night, ghosts beneath a low-riding sun, and rumors through the everlasting twilight for 236 years. There's not a holly bush or snow-bound alley in North Pole City that hasn't shared my secrets or tasted the blood I've spilt or had spilled, so when I tell you there aren’t many things that can chill my bones after all these years, you can believe it – it's the Christmas mail, as they say. But when we crept past what was left of the Polar Express, I also got that old yuletide feeling that something was off, like somebody had slipped an apple in my stocking and was telling me it was candy. The police had turned their sirens off, but kept the candy-striped red-and-whites flashing. Road flares sizzled and spat as they melted through the ice, throwing cold fire at the ruins of the iron mammoth. In its shadow emergency responders crept through the carnage, watching their steps as they unstacked and carried stretchers and passed about bodybags, some of them empty, some of them full. The emerald veil of the Aurora Borealis shimmered above, casting a green pall on the grim-faced elves who went about their business in an economical silence. The snow was fresh where it wasn’t upturned by the train crash, which was kind of how Cidertown felt all around. I turned right at Gingerbread Lane, took Peppermint three blocks upwind and parked, gravitating back to my old neighborhood like a drunk coming off a bender. A pair of maintenance elves smoked pipes outside of Gus’s On The Corner, still in their overalls before the neon light of a Budweiser sign that wasn’t there a week ago, and I had half a mind to pop in and see where it came from. When I stepped off the sleigh, Peppermint looked back at me, eyes large and glistening. He was afraid, and I gave him a carrot and scruffed his nose to cheer him up. It felt like wet velvet beneath my fingers. I turned around and there she was – Brandy Plumfrost, the last elf I needed to see. Brandy was hot fudge tipped over a mongoose with a whipped cream and cherry topping, an elf who’d pull a blade on a cob as quick as ask him for a ‘nog. Last I heard she was hanging around the workshop, getting real cozy with the company hats. I pulled out my pipe and clicked it along my partial – I lost my two front teeth in a sleigh crash in ’56 and I’d rather chew on a piece of wood than bite my tongue. Brandy pulled out her pipe – a real nice blown glass number twisted into a candy cane – and I winked up a cantrip to give us a light. “You’re not in too big a hurry, parking all the way down here,” she said. Brandy laughed that big, joyful laugh of hers that made her the only elf worth the tidings, and tiny bells woven into her braids jingled happily. When a transformer blew up the street, Brandy and I ducked into one another, knocking ourselves half-jolly. A shower of sparks rained over the crossing, and a tunnel of darkness rolled down Gingerbread Lane. And there we were, our hands to our heads, a kiss and kind words sweet between us in the winterlong night. We grinned, and Brandy’s skirt reflected in the snow, painting us in watercolors of red, blue, green and orange. It was real nice. It felt like old times. But when you’re an elf, nothing lasts forever – except you. Generators sputtered to life and emergency lights flickered on up the lane, and the demolished Polar Express became the only yule log burning in the neighborhood. A crowd had gathered. 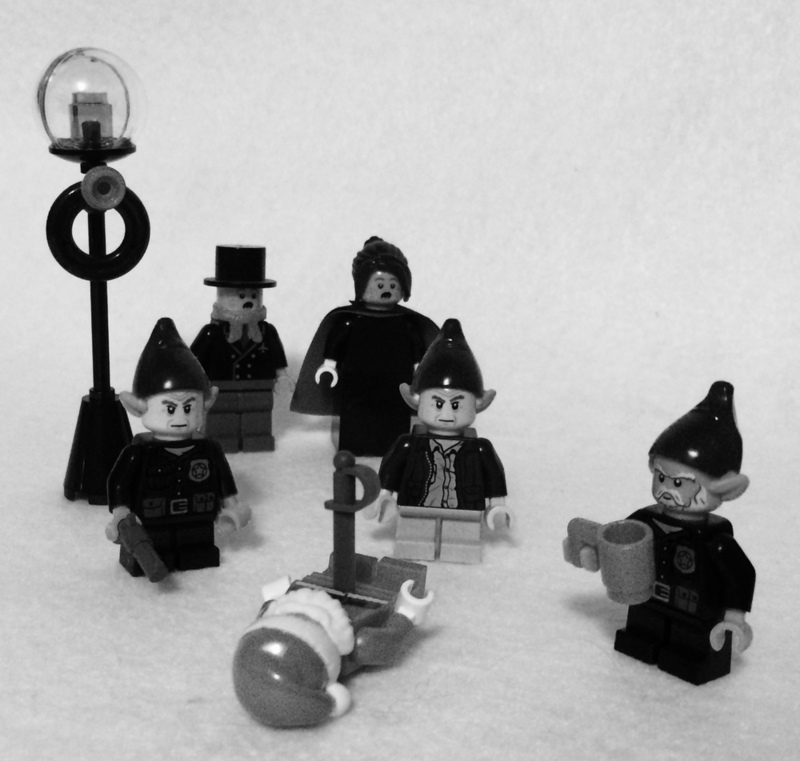 The shadowy outlines of elves crept close, cast large in the lights, and the crossing was starting to look more like a disco than a disaster. I tipped my hat and we smiled again. I missed Brandy like hell, and I’d be roasted if she ever knew for sure. I said I had to get to work and she turned around and kept on going to wherever it was she was heading, on her way to meet whoever it was she was making merry with tonight. That skirt was flashing all over the street. I pulled my vest tight around my shoulders, tilted my hat crooked the way I liked it, and walked up Gingerbread Lane, away from the bells of Brandy Plumfrost and towards the flames of my next case. I found Emberhearth crouched next to a passenger car halfway down the line, one of the ones that marked the transition between viable and demolished. It was parallel to the tracks, knocked on its side, and other than the fact it was beginning to snow inside through the broken windows, in pretty good shape. Emberhearth straightened up and shook my hand. “Garland! Thanks for showing.” Against my good judgment, I liked Nimble Emberhearth. It wasn’t his fault he could talk the fur off a seal and then make it sound like a deal when he sold it back at an upcharge, just the same that it wasn’t his fault the Village Council took a sparkle to him because of it. Emberhearth was a young, good looking elf, maybe a little green, but he knew he didn’t know much and was okay admitting it. The Emberhearths were a police clan, and I had worked with Nimble’s dad, but it felt like a bad break when Nimble grew up with the notion he’d be a cop. An elf like him could have gone places, made six figures and married up into Workshop, moved into a place in Santa’s Village with a view of the ocean and a self-driving sleigh built for six in the garage. But instead he wanted to be Chief of Police, and after a quick forty years, that’s what he became. Most of the old-timers didn’t like him because he baked his cookies in Internal Elffairs, but when I had to turn in my badge after the Black Friday Massacre, he was a good cob to me. Young Chief Emberhearth let me hang around, use the hall of records, park my sleigh in the police garage, do some consulting work. After a while, we had a notion we owed one another. Way I look at it, Nimble saved my life. For us elves, losing a job is a slow death sentence, and if you don’t believe me, take a tour of the ice pack around the city and count the elfsicles who couldn’t take it. We are born into our professions and live a life dedicated to our tasks, and then we’re unreasonably happy to sing songs about it. We never miss a day of work or leave even a second early. We find satisfaction in bringing joy to the world once per year, no matter how little the greedy swarm to the South deserves it. But when something bad inevitably happens at the workplace – an injury, a restructuring, a Workshop edict like the ones that shut down the wooden duck and young animal delivery wings – an elf is forced out of work, and in a way, out of life. It’s psychic despair. Everything seems pointless. For the eleven days I was unemployed, it felt like a breeze had blown out the candle in my soul, and then I was cold all the time. Some elves are able to recover and maybe start a business downtown where the Workshop hats keep their noses out, but most cobs waste a couple decades on a barstool looking for the bottom of a glass, or carving ornaments from scrap and fighting over the best pieces of wood in the garbage pile. Then one day that’s not enough and the great white expanse whispers to whatever magic is left in us, and then, like Emberhearth’s old man, we sneak out of town and walk into the icy teeth of the wind. Then we keep going until we fall. We eventually freeze solid, leaving an elf-sized mound in an arctic landscape full of elf-sized mounds. We call this making a snow angel. But truth is, some of that grim is why I liked an elf like Emberhearth who devoted himself to the mediocrity of public service. There’s nothing to be done but get out of bed and face down another day in North Pole City sometimes. We were both good at that. Emberhearth and I were likely thinking about snow angels while we traced the train tracks across the ice pack to where the line disappeared in the distance, trying to make sense of what lay ahead. I know I was. His dad was out there somewhere. Mine too. The end of the train painted a pretty picture in the night, though, and it was hard to believe what happened up the line existed in the same world. It was like we were frozen in time and the future had yet to be cobbled. The night looked calm, with flakes of snow floating in the light of a moon so bright you could go blind looking at it, and a frozen, silvery horizon was cut into the yawning eternity of the Milky Way. Somewhere across the ice was a vast, stormy sea, its waves moving South in all directions, and North Pole City stood at an epicenter of all things joyful, with the North Star fixed and warm upon our brows. Then I ruined it by looking the other way up the tracks. “That’s a quarter mile of pain,” I said. “Zero point three-seven miles,” Emberhearth corrected. Elves – we like to measure things. The other kids about fell over laughing in jolly gasps, and I’m pretty sure one wet his leggings by the way he waddled off with his eyes wide and rosy cheeks apple red. After I walked the car Emberhearth had been looking at, I got that apple-in-the-stocking feeling again. The rest of the train was demolished, painted with blood, mangled, sliced to pieces, even the brass and silver trim, but this one was as clean as a morning workbench. Emberhearth followed, picking up the things I had already picked up and setting them back down, taking notes in his book. A section of the roof was peeled back like a can of herring, and I stepped through into a well-trampled snowbank. The opening was twice my height, and I found a set of bootprints four times the size of my elf shoes. I soon noticed a gap beneath the car. It was big enough to hide in, and I got down on all fours. And there it was: two words written in the snow. A message. Emberhearth crouched behind me, adjusted his glasses, and made a noise in his throat that was a slice of surprise with a scoop of curious on top. “What’s that?” he asked. “Looks like somebody was wrong,” I said. Emberhearth flagged down a Sketchtographer, and then he held his thumb before his eye and measured the gap. Soon he was measuring the writing in the snow, scribbling away in his notebook the whole time. I slid out and found my pipe. The train car was now buzzing with elves, and the crime scene became as informative as the men’s room at Gus’s On The Corner. I headed back towards my sleigh and Emberhearth appeared next to me again. “I’m fine.” I waved him off and patted my vest as I walked away, then stopped short. Where I hoped to feel my billfold, there was only an empty pocket. My wallet was gone, and I knew exactly where it was and what it was doing – with Brandy Plumfrost, buying her drinks. And drinks for whomever else she was with. I told Emberhearth I’d take that advance and give him a jingle in the morning. He said, “What morning?” and we laughed a little. The snow was picking up and the wind had found its teeth. This place; it’s not easy. When I approached the sleigh, I saw Peppermint was gone. I checked the leather reigns and the edges were cut clean, as if with a knife. Or with whatever cut up the 9:40. The streetlights were still out, and a gaudy rune burned into the side of my sleigh was glowing with St. Elmo’s fire: “My place. Now-ish? – S.” I checked to see if Peppermint got away clean. His hoofprints were neat and regular in the snow, trailing around the block towards home. That put me out some coin for the reigns, but no real harm was done. It was a definite pain in the lap-warmer, though, which was Santa’s style. That bowl full of jelly wanted me on the shoe-leather-express. I was on his list; he wanted to keep a close eye on me. I walked across the street and went into Gus’s for a cider. The way I was feeling I could drink a barrel. Inside, the fireplace was delightful, and it blazed with cheery warmth, but the bar remained empty except for Gus and I. Built like a bowling ball and covered in tattoos of all the fights he’d lost, Gus climbed down from atop the bar, where he was taking advantage of a slow night to clean the ceiling fans. All the usual cobs were up at the Polar Express, pitching in to do what they could, not only out of the goodness of their hearts but because we’re elves and there was work to be done. Like all decent bartenders, Gus put my drinks down before he asked how I was doing. I drank my shot of rosemary moonshine and chased it with a gulp of warm cider, then I told Gus I was doing okay. Gus set another shot in front of me, and I raised it before the fire. It looked like honey. Maybe Emberhearth was right again – maybe there wasn’t going to be a morning. And maybe that would be for the best. “Don’t know yet.” What I didn’t want to tell him was it was Santa’s biggest killing spree in twenty years. Not only that, but he’d kidnapped a Souther or two. Who else up here wouldn’t believe? Who else would think hiding could work? Santa Claus didn’t always sneak into houses and leave presents under a tree, you know. There was a time when he was a god of the hunt who rode a golden chariot across the sky, with a great, slathering pack of hounds by his side. Occasionally that comes back when the season’s greetings press upon him too heavily, and he’ll go off the deep end and get confused, or just plain angry. That may sound unlikely from what the elves in Outreach have told you, but we’re all a little angry up here in North Pole City. Year after year. Christmas after Christmas. A world of greedy Southers demanding patronage from those of us who had been blessed with magic, making us out to be dullards and infantile sprites. “You ever wonder if there’s a point to all this?” I asked. Gus looked at me for a moment, then got up and opened the door to check the street. Wind lashed in, throwing snow around, then Gus closed the door and returned. “Look.” He pulled up his shirt, revealing a tattoo of a polar bear’s face spanning his chest. The beast was snarling, its muzzle red with blood. “This here is the bear that killed my twin brother,” he said. “Same bear who left me for dead.” Gus lowered his shirt, fixed his suspenders. “See, Fizz and I were rounding up his reindeer after that storm came through and nearly buried us all in ’77, and after carving circles around the city for two hours, we’d about snow-angeled ourselves. Fizz was funny like that - once he set his mind to something he could do it forever. But it worked. We found his herd, one by one, until only one lost deer, Tinsel, was left. And we found her, too. Problem was, a polar bear found her first – we were too late. But my brother Fizz was a shepherd. He loved those deer. He couldn't help himself. When he jumped out of the sleigh and tried to chase that bear off, it was the last thing he did. Gus walked around the bar and poured us both another round, keeping his story going. I sipped my cider and we kept that under the tree for a while. I figured Gus was trying to tell me that his brother was a shepherd who died doing what he loved, and odds were, I should march up that mountain to Santa’s Cottage and do the same. Neither of us spoke, though, and the pop and crackle of the fire traipsed around the room. I broke the silence when I asked Gus if his story was true, and he said it was. And for how I was feeling with the warm glow in my stomach, with big flakes of snow falling outside, with senseless tragedy right up the street and the madman responsible laughing merrily atop a gleaming hill at the top of the world, what Gus was saying was close enough to true. Maybe there didn’t have to be a reason – nobody asks a diamond why it’s a rock. We’re elves. Magic surrounds us. We wake up each day in the cradle of love. And it's never, ever going to be enough. We have to live with that. I finished my cider and left Gus too much tip. He handed the money back and said he’d see me around. When he asked where I was going, I told him I was off to find my wallet, which, as far as I could tell, was as true as anything else in this city. Matt Perez is a writer, teacher and line cook. One of these thing happens at home, one happens at Penn State, and the other happens at an Italian restaurant. He is an Assistant Editor at Barrelhouse and co-captain of the magazine's special teams unit. You can ignore most of the things he says on Twitter @MattPerez18. Ode to the Double-Crossed Lacky in "Thunderball"
They really did you in Mr. Angelo, didn’t they, just when you thought it was going to be ok and the quarter of a million dollars they offered to transfer to you via a square white briefcase would be your ticket out of here, new face or old. And the rotten part is that no one will ever recognize you for who you are, outside or in, or that you did it all for Lorraine, who thinks you’re still abroad somewhere doing secret work for the government. You went for it all, two excruciating years of extensive pilot training, voice lessons, film clip analysis, multiple, painful plastic surgery operations. They stuck needles in your cheeks and piled ice packs on your swollen neck until it grew numb and hard and blue. You became him, some Bond girl’s brother, all for the elaborate ruse hatched by some guy you never even met — a guy with a cat, for God’s sakes. You always hated cats. They made your hands itch and your throat close up. No amount of plastic surgery can change that. You flew the plane and stole the atomic bombs like they asked you, and landed that plane gorgeously on the water right next to their luxury cruise liner—so precisely your own sister would be proud if she knew. You remembered as kids flying remote control planes, watching them dot the sky like birds, double crossing each other’s paths again and again. As you unlocked the plane’s wheels and thumped them on the ocean floor, you thought of your sister’s laugh and it made you sad. If it makes you feel better, days after the henchmen sabotaged your seatbelt, cut your oxygen mask and left you at the bottom of the ocean to drown, they, too, died in painful ways—spears through the heart, torn apart by sharks. This is the price you pay working for evil. It’s a shame. All that work for that ungraceful, undignified end. You’ve read the O’Henry tales of irony and might’ve even heard stories of the British government releasing Nazis back to Germany with lies on their tongues. We’ve glorified the villains and incorporated them into our language and lore — Benedict Arnold, Judas, Tokyo Rose. But for you, nothing. No term or song, no grand explanation or chance to escape. Just a stillness after the panic ceases, a gentle rocking on the bottom of the ocean, and those dreams, the flickering film strips of what might’ve been. Tara Laskowski is the author of Bystanders (Santa Fe Writers Project) and Modern Manners For Your Inner Demons. She has been the editor of SmokeLong Quarterly since 2010, and is a columnist and reviewer for the Washington Independent Review of Books.